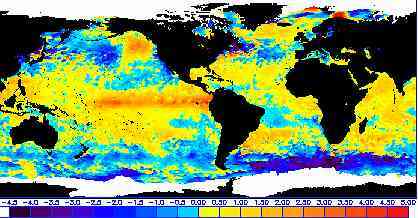 NOAA climatologists currently classify the El Nino still growing in the Pacific Ocean (red band on yellow above) as moderate, but the ocean waters continue to warm and El Nino climate conditions are expected to dominate through February 2003. Map courtesy National Environmental Satellite, Data and Information Service of NOAA. November 8, 2002 Washington, D. C. - The El Nino in the Pacific Ocean which has building up for months continues to warm and NOAA scientists now classify its intensity as "moderate" with caution that its full intensity still not known. Many drought areas will continue to suffer, but its influence on climate over the next four to five months is not expected to be as strong as the 1997-1998 El Nino.